You will be received at the New Delhi airport by our representative and will ne transferred to your hotel for overnight stay. 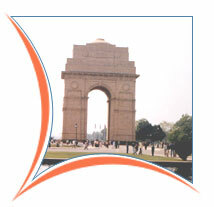 After breakfast, you will go on a sightseeing tour of Delhi. The highlights of the tour will be Qutub Minar, Humayun's tomb, driving past the Rashtrapati Bhawan (President's Residence) and the Parliament and a halt at India Gate. After lunch, you will go to see Red Fort and Jama Masjid in Old Delhi. You can also try a rickshaw ride in the old winding streets of oldest living market of India known as Chandani Chowk here and explore it for souvenirs and some of its famous delicacies. You will also visit Rajghat, the memorial of Mahatma Gandhi, the Father of India, Birla Mandir and Lotus Temple. In the evening, there is an interesting musical sound and light show at the Old Fort in store for you. Overnight stay at the hotel. In the morning, savor a heavy breakfast of typical Indian cuisine and delicacies. Then, drive to Jaipur. Check in at the hotel and go an excursion to Amber Fort on elephant safari. The highlights of the fort are 17th century Shish Mahal of 17th century and Maharaja Man Singh's Palace, the king who had 12 queens! In Jaipur, you will visit Jantar Mantar, City Palace of the Maharaja of Jaipur and the royal museum. In the evening, you can explore the colorful bazaars of Jaipur and do some shopping too. Dinner and overnight stay at hotel. In the morning, drive to Jaisalmer and check in at the hotel. Sightseeing tour of the city is scheduled for the day with Jain temples inside Sonar Qila, Palace Museum within the premises of the fort, Patwaon ki haveli with intricately designed latticed windows and the Gadisar Lake as its highlights. Overnight stay at hotel in Jaisalmer. In the morning, start on your desert safari on a jeep to Sam Sand Dunes. Rest in a tent for some time and notice the shifting of sand with the sun as you bask in the mild and warm winter sun. The changing colors of the sand dunes with daylight and riding up the sand dune and driving down from it in high speed is quite exhilarating and adventurous experience. In the evening, there is traditional Rajasthani meal and folk dance and musical performances done by folk artists dressed in colorful traditional attire. 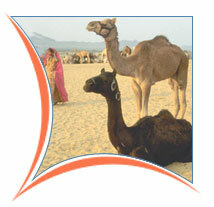 Interact with warm and friendly natives of Khuri, a small Rajput village near the Sam. The haunting melody of the flute at sunset will make your stay at camp memorable. Live in a traditional Rajasthani style camps with jute beds known as 'charpais', illuminated by oil lamps. A bonfire at the night with barbecue dinner party, accompanied by Manganiyar musicians, rhythmic beating of drums such as Dhol and whirling dancers create an enthralling sight. Overnight stay at the camp. In the morning, drive back to Delhi, where you will get transfer to the airport so that you can catch your flight to onward destination.